CarGurus has 25,873 nationwide 3 Series listings starting at $1,000. Since its introduction in 1975, the BMW 3-Series has attained benchmark status for a whole class of luxury compact performance vehicles. This year it won its 17th straight 10Best trophy from Car and Driver magazine. While other car manufacturers have attempted to combine smooth high performance, supple handling, and comfortable interiors, only BMW seems to have consistently found the right combination. The 3-Series for 2008 incorporates the cleaner lines and more powerful engines that evolved from BMW's 2006 redesign. The 3-Series is composed of four body styles, two engines, two transmissions, and a choice of rear- or all-wheel drive. The body styles are sedan, coupe, hardtop convertible, and wagon. The 328i trim level offers all of these body styles in a rear-wheel-drive configuration, while the 328xi offers the coupe, sedan, and wagon in all-wheel drive. The more-powerful 335 is available as a rear-wheel-drive coupe and sedan, while the 335xi is the all-wheel-drive version of the coupe and sedan. As with any high-performance automobile, the engine defines its essence. And BMW engines express the artistry at the heart of these vehicles. The heart of the 328i and 328xi trim lines is a 3.0-liter inline six-cylinder engine that produces 230 hp with 200 pound-feet of torque. The engine is an engineering marvel, using new lightweight magnesium/aluminum composite alloy for the engine block. Along with this, BMW has incorporated its Valvetronic variable valve lift technology in a six-cylinder engine for the first time. With a six-speed manual transmission, BMW claims a 0-60 jump in 6.3 seconds. The EPA fuel estimates show off the technology built into this engine, for when paired with the automatic transmission, the EPA rates it at 19/28 mpg. Seemingly never satisfied with its engineering achievements, BMW showcases even more impressive performance with the 335i and 335xi trims. Working with the same 3.0-liter inline six, BMW added twin-turbos and direct injection to produce 300 hp with 300 pound-feet of torque. BMW conservatively gives a 0-60 time of 5.4 seconds, but Edmunds blasted across the 0-60 jump in 4.8 seconds with an automatic transmission. And once again the icing on the cake comes with an EPA estimate of 17/26 mpg. Both the 328 and the 335 come standard with a six-speed manual transmission or an optional six-speed Steptronic automatic, which includes normal, sport, and manual shift modes. The 335 models offer optional steering-wheel-mounted paddle shifters, which cut the transmission's response time in half. With impressive acceleration comes the handling that established the factual basis of BMW's "ultimate driving machine" slogan. Edmunds says the 3-Series "slices cleanly through corners like a Ginsu knife and sticks like Super Glue." Reviewers are unanimously impressed with BMW's handling qualities, citing the sense of confidence it gives drivers in every conceivable road situation and condition. They further cite the engineering triumph BMW achieved in providing more trunk space by using space-saving but harsher run-flat tires and still allowing the car to remain comfortable over broken road surfaces. Equipped with large disc brakes, BMW 3-Series are uniquely fitted with a BMW innovation that automatically wipes brakes dry when windshield wipers are in use and sets the brake pads closer to the rotors when the driver abruptly lifts his foot off the accelerator, thus anticipating an emergency move to the brakes. This braking system is part of the active/passive safety systems incorporated in all 3-Series vehicles. The BMW 3-Series includes as standard safety equipment antilock disc brakes, dynamic brake control, stability control, run-flat tires, front-seat side airbags and full-length side curtain airbags. Adaptive Brake Lights are also included - they glow brighter as brake pedal force increases. Of course, the convertible lacks side curtains, but its regular front side airbags extend up to head level, and pop-up rollover hoops are also included. The National Highway Traffic Safety Administration awarded the 3-Series four out of five stars for both driver and front-passenger frontal collision protection. It also won five out of five stars for protecting all passengers in side impact collisions. Further, the Insurance Institute for Highway Safety gave the 2008 3-Series the highest possible rating in both frontal offset and side impact tests. Reviewers were also unanimous in their praise for the high-quality materials, exceptional build quality, and modern design of the 3-Series cabin. An Edmunds reviewer sums it up best when he writes that BMW interiors "provide a restrained show of luxury." Up front, the seats are both comfortable and supportive. Naturally, one would expect that the "ultimate driving machine" would have all the proper adjustments for perfect seating, and it does. Besides the standard tilting and telescoping steering wheel in all 3-Series cars, the 335i and the 335xi trim lines have standard eight-way power seats. However, two areas of the interior did receive criticism. While BMW claims the rear seats are suitable for three adults, reviewers felt they were more suitable for two adults, and even then they complained of a lack of legroom. Reviewers also have a running animosity toward BMW's optional electronic device-management system, better known as the iDrive. Buyers should familiarize themselves with this system before making a decision to purchase the optional navigation system, which works via the iDrive. But despite this flaw, the BMW 3-Series remains the benchmark in its category of upscale, midsize performance cars. 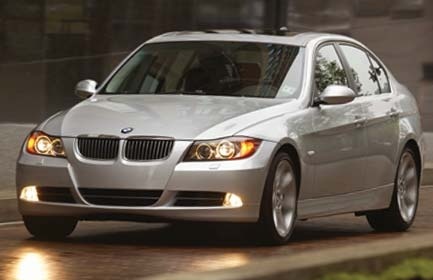 What's your take on the 2008 BMW 3 Series? Users ranked 2008 BMW 3 Series against other cars which they drove/owned. Each ranking was based on 9 categories. Here is the summary of top rankings. 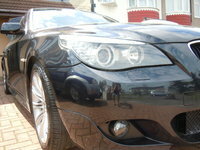 Have you driven a 2008 BMW 3 Series? The vehicle started fine the day before, now a no crank condition. door open rings and works, dash/accessories work. when I put key in I donot get dash key light up. a dash line illuminates.